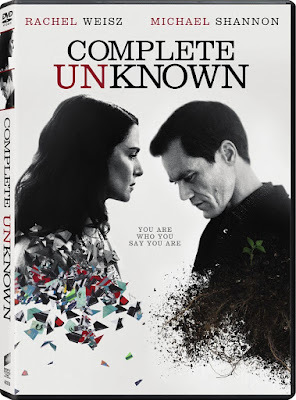 Though Complete Unknown comes from a screenplay written for the screen by Julian Sheppard and director Joshua Marston (Maria Full of Grace), its narrative often feels best suited for a theatrical production. It isn’t just that the script is dialogue heavy, or even the fact that each act of the film has a convenient change of location. It feels suited for theater because of the level of intimacy created within the narrative. Michael Shannon and Rachel Weisz give such nuanced performances that I often felt as though I knew them in real life. If a filmed version of these performances gave me the impression I was in the same room as the actors, I can only imagine the reality would be that much more impressive. But Complete Unknown is about more than just the performances, and as excellent as Weisz and Shannon are, Marston never allows the narrative to exploit their range with petty melodrama or pointless emotional outbursts. This is a film about ideas, examined through the framework of characters, real enough to give the subject weight. There are questions raised about the impact of large changes on the human personality, whether what we do has the ability to alter who we are, but none of these ideas feel forceful within the natural pacing of Complete Unknown. The film takes place over the course of a single evening, beginning with a conflict before moving on to something of a mystery. Tom (Shannon) is having a birthday party with close friends, though he is stuck on a troublesome dilemma. His wife (Azita Ghanizada) has been accepted into a program across the country in California, forcing Tom to decide between leaving everything to join her and staying to keep commitments made with his business partner, Clyde (Michael Chernus). This decision lingers over the entire evening, even discussed by his group of friends during the party, and questions of Tom’s future resonate even deeper when his past intrudes on the evening. Clyde brings a date with him to the birthday party, unaware that Alice (Weisz) used to go by the name Jenny. The revelation about Alice’s true identity may be exosed a tad too soon, though answers as to why she is at the party are withheld for a bit longer. The first half of Complete Unknown is something of a balancing act, building suspense upon the secrets that the other members of the party aren’t privy to, as well as those also kept from the audience. The problem is that the question of when the party will find out the truth quickly becomes irrelevant and the narrative instead switches directions completely, focusing on the larger ideas by sacrificing the intriguing set-up without permitting proper resolution. It is the narrative equivalent of showing a gun in the first act without ever allowing it to go off, but this unconventional and occasionally unsatisfying approach stays dedicated to the larger themes at play. Complete Unknown is far from a perfect film. There are tonal inconsistencies which are hard to ignore and the complete dismissal of half the characters from the narrative feels somewhat like a cop-out. On the other hand, it features some spectacularly un-flashy performances from its cast and offers ideas without the typical narrative clichés to undermine them. It is a thoughtful film, which makes any shortcomings easy to forgive. The DVD includes a commentary track with Marston, who explains the thematic ideas within the film in greater detail.